Back in the spring, I tracked down a Food Truck sponsored by Dos Equis. Billed as “The Most Interesting Taco in the World” – they had hired a well-known local truck, Rock and Roll Tacos, reskinned the outside, and sent it out to give away interesting tacos. They called it “Feast of the Brave.” I had shark and iguana tacos… and they were so good, it wasn’t even brave to eat them. 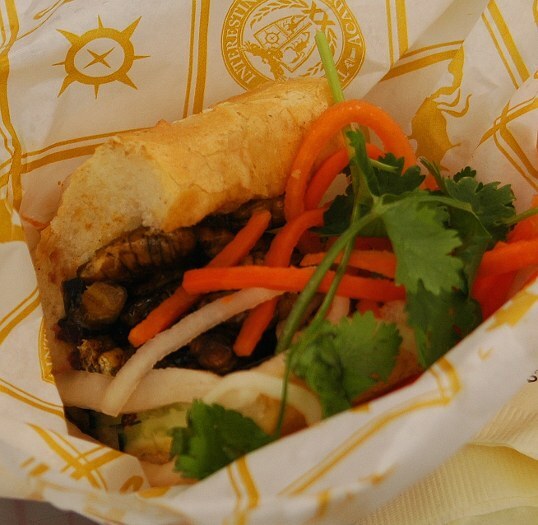 Dos Equis is doing the promotion again, this time with the Nammi Truck, which usually serves Banh Mi sandwiches. 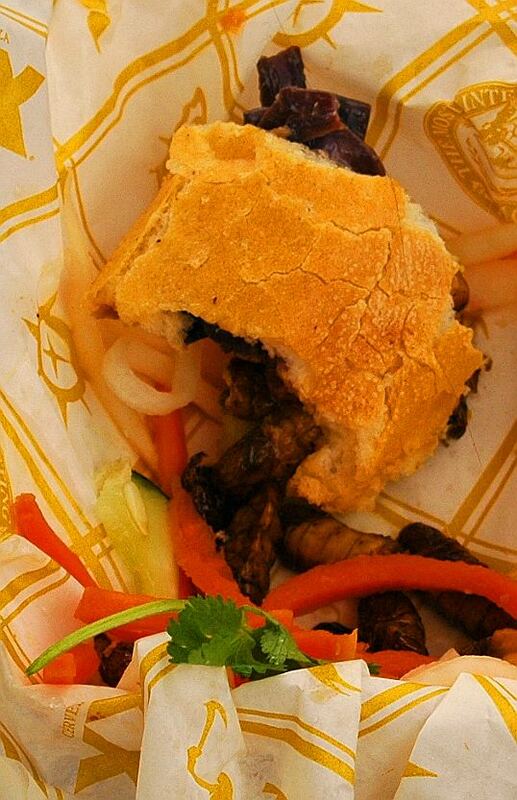 They’ve made up some sandwiches with Jellyfish, Quail, and Silkworms. The silkworms are billed as “Soy Silkworms” – but that means they were fed on soybeans… they are the real thing. I have always wanted to eat some insects, so I decided to track them down. Today I had a long bicycle ride planned, but the weather didn’t cooperate. The streets were very wet and the rain spitting down. I’ve done some work and have replaced the spokes on my ancient Raleigh Technium 460 road bike so I took it out around the neighborhood. It worked great, though I was nervous with the narrow tires on the slick tarmac. So, I had the day and had to make new plans. A quick look at the Internet and I discovered the Nammi/Dos Equis truck was down in the Arts District outside the grand opening of the new City Performance Hall. I grabbed my stuff and rode the DART train downtown. “Oh, you want to go for it right off?” said one woman as she handed me a sandwich in a paper tray. Until the moment that I looked down at the food I never really thought much about actually eating silkworms. They were brownish, obviously segmented bugs, and bigger than I had imagined. I guess it is the pupae stage of the silkworm that is edible… they were almost the size of the last joint on your little finger. There were plenty of them in a sandwich. I walked over to a little table that had an umbrella (intended for shade… the rain water poured through it) and tucked in. The worms were, not surprisingly, crunchy. They had a bit of a nutty taste… though, really they tasted like… well, bugs. While I was eating a couple walked up to me. 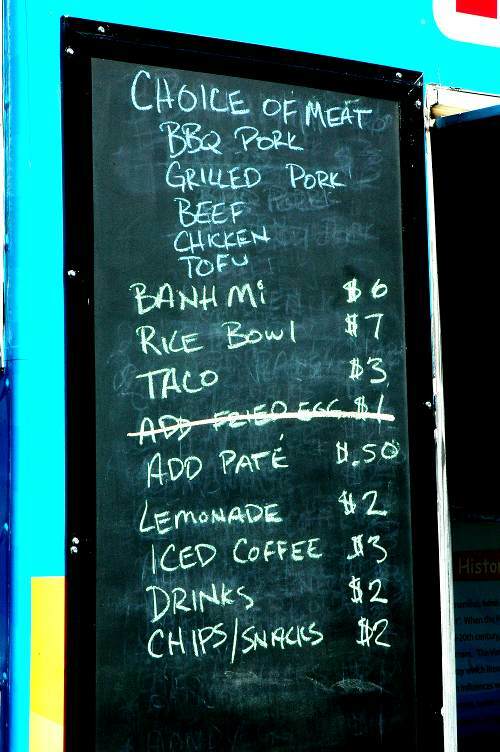 We talked about the various other food trucks lined up. They did a good job of holding a normal conversation with a stranger that was shoveling insect pupae into his mouth. The guy had been to Vietnam and talked about the sandwiches and how they weren’t really sure about what was in them, but they were good. Now, I was finishing my order. 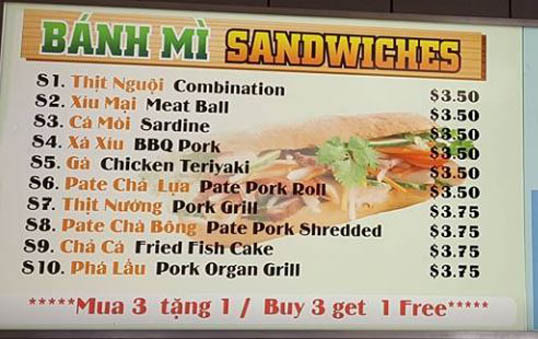 I love the Nammi Banh Mi – they are more expensive than the usual Vietnamese sandwich – but they are very generous with the meat (the pork, of course, is the best). A bunch always falls out into the little tray and you get the extra enjoyment of finishing off the spicy filling along with whatever vegetables have also fallen out. So now I looked down at the little tray and there, true to form, was a little pile of Silkworm Pupae along with some daikon, cilantro, and shredded carrot. Should I eat the worms? I did. It was a little harder to eat the little buggers bare like that – without benefit of the sandwich bread concealing the fact that I was eating insects… but I figured if I’m up for it, I’m in. Like most from my generation, I have always felt a compulsion to finish my plate. Insects consumed, I headed into the performance hall for the opening day festivities. But that’s a story for another day. The Nammi folks trying to stay dry. 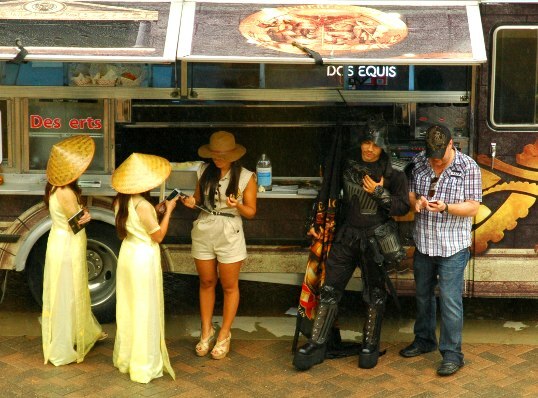 They were all in costume for the Dos Equis “Feast of the Brave” food giveaway. Proof I ate it – only a bite left. While I was eating, a rugged group on bicycles, braving the rain, came up for some food. I live in Richardson, Texas – a first-ring suburb of the enormous Dallas-Fort Worth Metroplex. For the last year or so, I have been enjoying tracking down the various Gourmet Food Trucks that wander the highways and byways. I have been finding them at various locations – mostly in the Dallas Arts District – but have yet to have one show up in my own hometown. 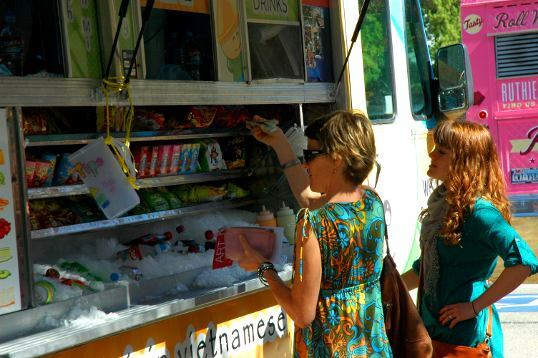 The one struggle for the Food Trucks all over the country is finding locations to park. The owners of brick and mortar restaurants traditionally have a lot of political clout and are always working to enact harassing regulations designed to eliminate the portable competition. I have plenty of sympathy for restaurant owners – that has to be one of the hardest ways to make a living – but I think they are mistaken. 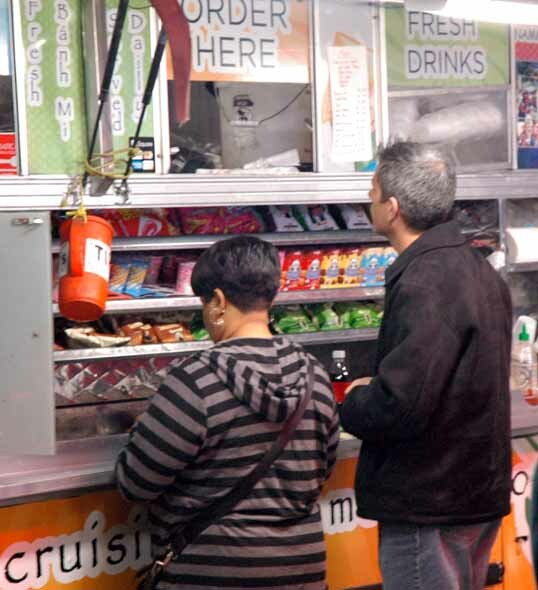 The food trucks are mostly a quality replacement for fast food plus they get people used to eating out more. I don’t think the food trucks are a serious threat to quality restaurants. 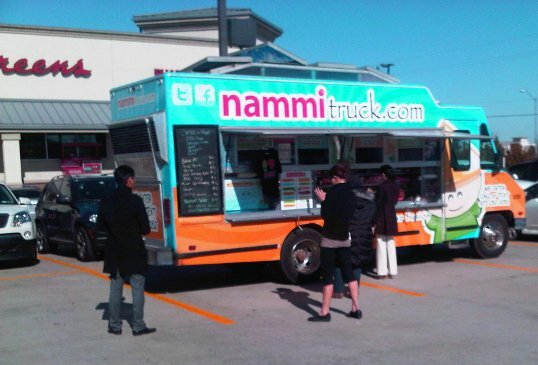 So I was excited when I left work and checked my social media and found out that the Nammi Food Truck (one of my favorites – First Visit – Second Visit) was going to be setting up for dinner in Richardson. They were going to be at the RunOn! store at Campbell and Coit – not very close to my house – but I wanted to support a truck coming out to my town. 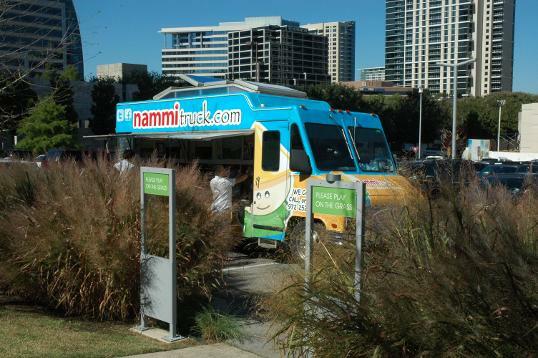 The Nammi Truck serves Vietnamese Banh Mi sandwiches, rice bowls, and fusion tacos. I drove home, checked with Candy and decided what to get, and then drove out to RunOn!. That store brings back a lot of memories. When Lee was younger we used to drive him out there for running lessons. I used to kid him about “lessons” – I’d say, “Left, Right, Left, Right… how hard can it be?” It worked though – the direction and practice Lee received helped him become a good and enthusiastic long-distance runner. While he would run I would hang out at the Starbucks or wander around the shopping center. There is a lot of interesting stuff around that intersection. Tonight there was a recreational run going on with a nice little crowd of runners outside the store, stretching, talking, hanging out, and getting ready to head out together. Saucony was there with a truck loaning out test shoes (WTF?) and promoting their products. They had an Xbox Kinect hooked up on the back of their truck and the runners would take turn playing track and field games – running in place, jumping, and throwing a virtual javelin. It looked like a lot of fun… I’m an old fart and had never seen the Xbox Kinect working before. 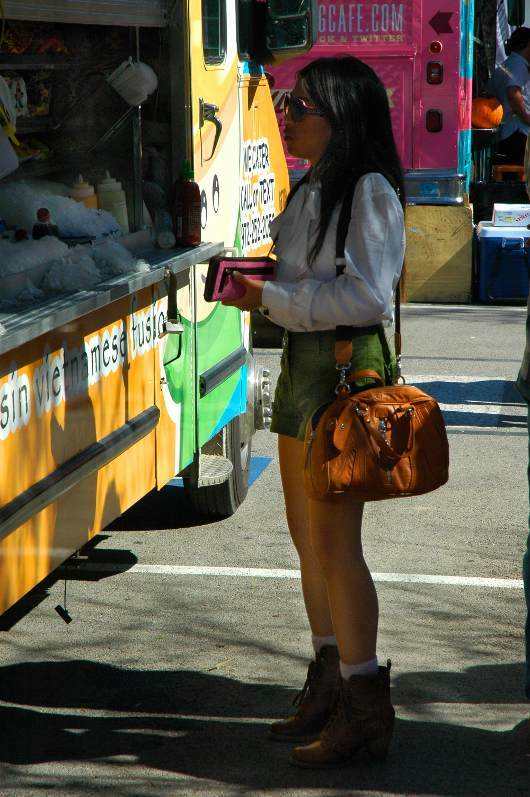 There was a continuous short line at the Nammi Food Truck. I waited my turn and ordered a BBQ Pork Banh Mi sandwich (these are big sandwiches and Candy and I would share it) plus a lemongrass chicken taco and a beef taco. It didn’t take long and I took the stuff home for dinner. As always, it was good. Nammi tacos. They taste better than they look in this picture. I had a day off of work and was being lazy when I began to feel a mite peckish. 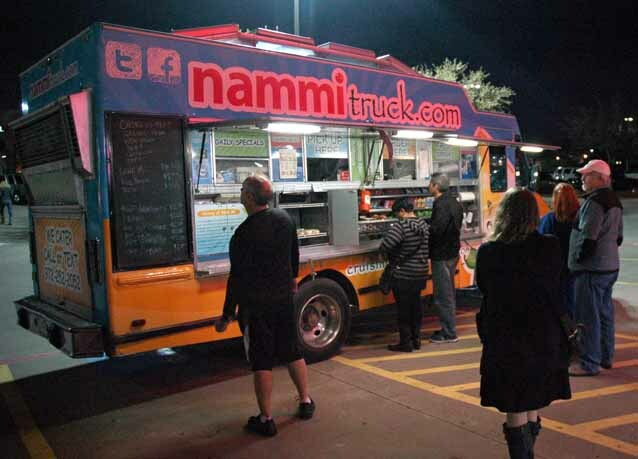 I checked my twitter feed and discovered that the Nammi Food Truck was setting up in a Walgreens parking lot on Beltline in Addison – not too far from my humble home. 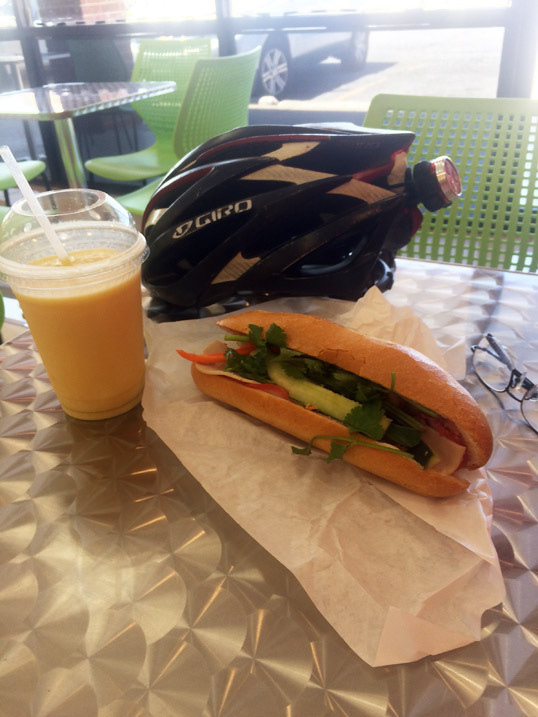 Some Bánh mì would hit the spot, so off I went. 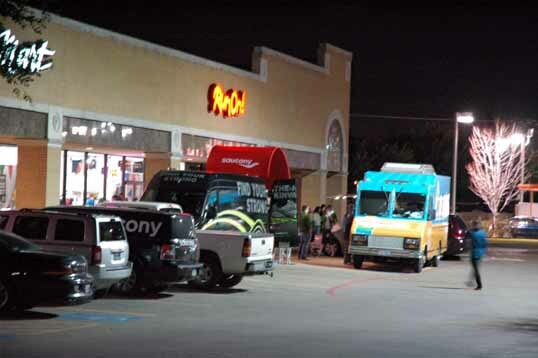 One of the tough nuts to crack as gourmet food trucks become more and more common is where do they find a place to park. Restaurant owners tend to be powerful political players and always work to restrict their competition – especially mobile cavalry type competition that can swoop in on a moment’s notice and gobble up valuable customers. Now I realize how difficult it can be to run a restaurant and sympathize with their plight. But I also don’t think that competition is always a bad thing. The more options people have the more they will eat out and the more business will be driven to restaurants in general. I’m in the minority on this, of course. So the food trucks have to fight restrictive ordinances to find a place to set up. It is rare to find them out in the suburbs, so I was glad to find one at a Walgreens. Addison is lousy with restaurants and all the parking lots were full with folks out for lunch from work. There were only a couple spaces left in the Walgreens lot. A steady flow of customers, about two or three deep were ordering at the little window at the bright blue truck. Everyone would order, then stand around typing on their smart phones while their sandwiches were put together. I waited my turn, ordered a grilled pork Bánh mì and pulled a cold Diet Dr. Pepper from a mound of ice in the front of the truck. The guy nodded. I guess that’s fair. They give up a bit of their parking lot in exchange for customers that come inside for drinks and maybe some ibuprofen while they are at it. I almost went inside, but didn’t want the hassle. I had writing to do, my first strong idea for a story that I had had in weeks, so I carted my sandwich off to the library, and filled my water bottle from the drinking fountain. It was very good, by the way. 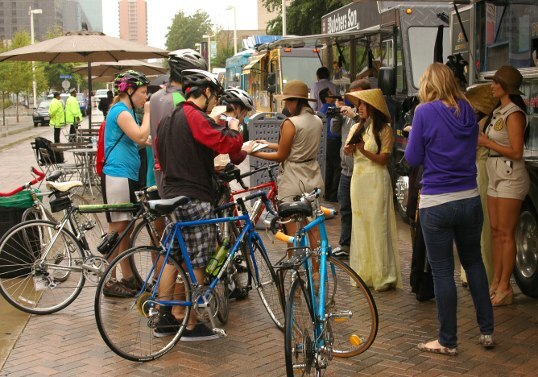 Oh, and it was food truck heaven in the Dallas Arts District! I was hungry and the trucks were arranged all up and down Flora Street. So much food and so little time. Mae West said, “When choosing between two evils, I always like to try the one I’ve never tried before.” That always seemed to be good advice to me. So in choosing between six food trucks, I decided to eat one I’ve never tried before (by the end of the day, I had tried three). I picked out The Nammi Food Truck. I wanted some Vietnamese food! I wanted some Banh Mi. A BBQ pork sandwich and a drink was the ticket. There were plenty of customers hanging around, but the food came quick. They had some sauces in squeeze bottles down in the ice in the front compartment – spicy mayo, cucumber (I think), and Sriracha. I filled ramekins with cucumber and rooster sauce. 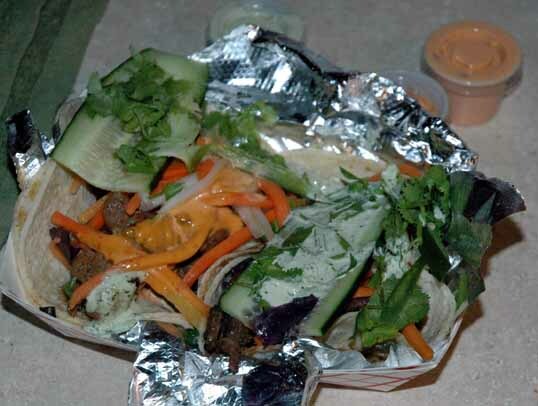 Banh Mi from the Nammi Food Truck. 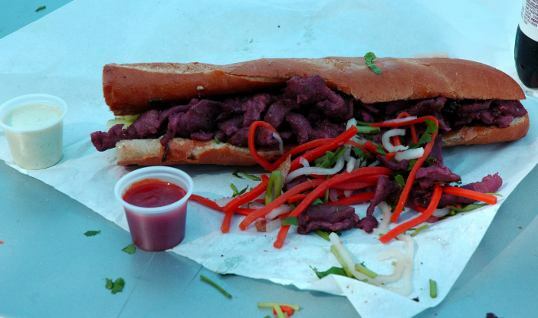 Giant sandwich with rooster sauce and ... some other sauce. The sandwich was huge and stuffed with stuff. One woman at another table was gesturing at her sandwich and yelling, “It’s bigger than my arm!” My only complaint was that I didn’t open the paper carefully enough and too much stuff fell out. It was really good. I want to go get another. A couple sat next to me eating their Banh Mi. The sandwiches are on the messy side. Some of the good stuff spills out and falls on the ground. 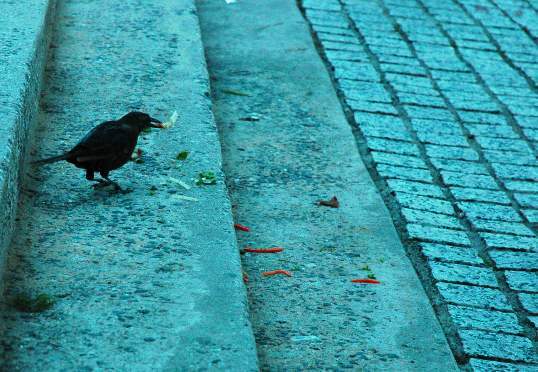 Luckily the cleaning crew is right there to hop on things right away and fly away with the leftovers.